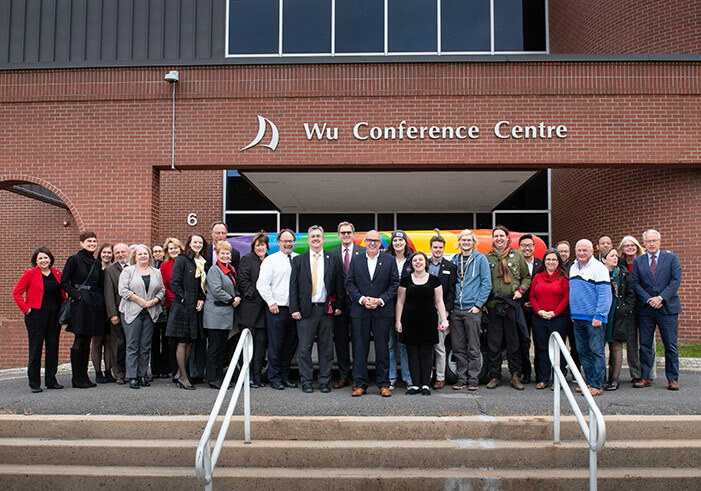 The Paddle Your Own Canoe Project and Chestnut Pride, a restored canoe featuring a striking rainbow design, made an appearance at UNB’s Board of Governors meeting on Oct. 18. The Board of Governors saw the beautifully restored 60-year-old canoe up close and took the opportunity to provide financial support for the project. Norm Betts, UNB business professor, former politician, finance minister and member of UNB’s Board of Governors, donated the canoe to Imprint on behalf of Miramichi Canoes. Reid Lodge is one of the founders of Imprint Youth Association, an organization for LGBTQ youth. Members of Imprint Youth Association hope to raise enough funds from the Paddle Your Own Canoe Project to create a space in downtown Fredericton for LGBTQ youth to socialize and connect. Imprint Youth Association is informed by youth and organizes various events in Fredericton, including activities at the Fredericton Public Library, such as free make-your-own sundae nights, zombie costume creation nights and glitter art workshops, as well as Pride Youth Prom at the Charlotte Street Arts Centre. The purpose of the centre is to provide a supervised and welcoming environment where LGBTQ youth feel accepted and supported. Tickets for the raffle are $100 each and are available for purchase on Paddle Your Own Canoe Project. Mr. Lodge, who performs advocacy work on behalf of transgender and LGBTQ groups, graduated from UNB in 2016 with an MA in English. He currently works at UNB as a proposal support officer for individual faculty/staff NSERC and NBIF grants.